For a large portion of June and July I was working from home instead of my Gastown office. When I returned I was surprised to learn new eateries had opened around the area in my absence. 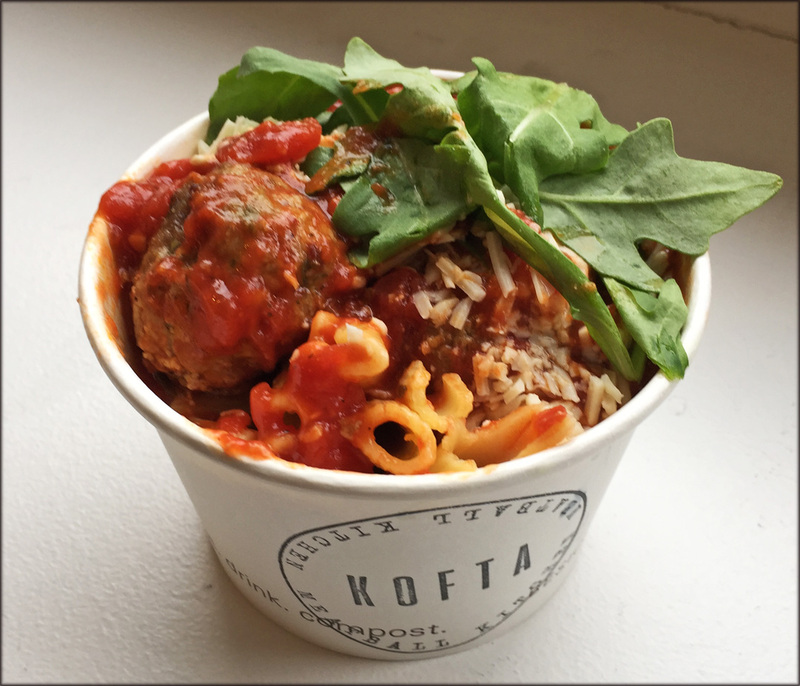 The first restaurant on my “To Try” list was Kofta Meatball Kitchen. 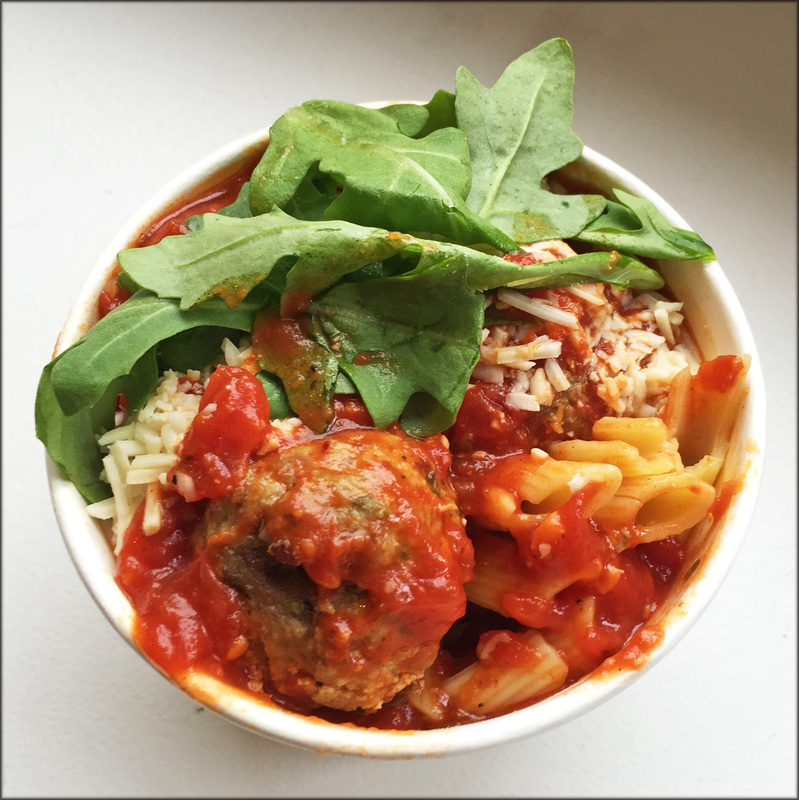 Their selling point is gourmet meatballs either served in sandwiches or personalized bowls. 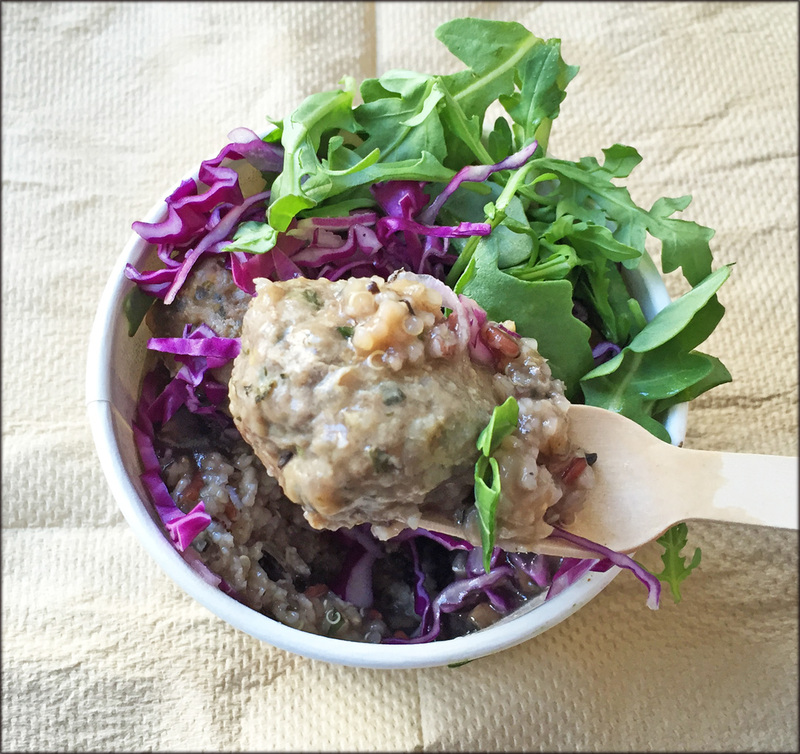 On my first visit, I created an eccentric bowl consisting of Beef and Ricotta meatballs that sat on top of a quinoa and rice mixture, covered with mushroom gravy and shredded cabbage. Each bowl comes with 3 meatballs. I enjoyed the beef balls I chose. They were soft, beefy, and were not loaded with fillers. Also I could taste the Ricotta. However the rest of my choices were mediocre. The ingredients didn’t seem to come together to create a satisfying meal. The mushroom was savoury and tasty enough but only a small amount was given; it barely soaked the carbs I picked or covered the meatballs. The quinoa and rice, and cabbage were just kind of there, not really adding anything special to the bowl. 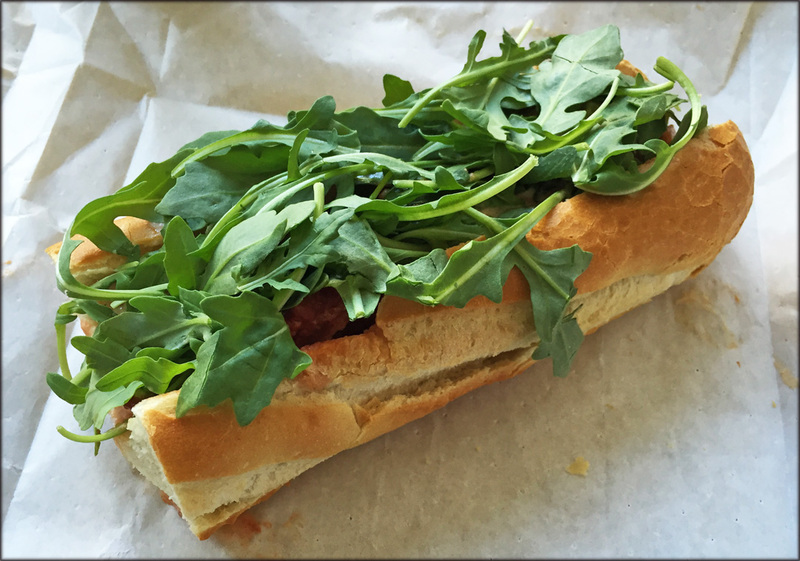 Arugula and a chunk of baguette were randomly given to complete the order. I got the feeling these were provided to up the perceived value of the bowl. However for $11, I really didn’t feel like this was worth the price. My take out container was the typical large soup eco to go cups that measured 3 inches in height with a 4.25 inches diameter. The size of the take out looked similar to the tin cups used for those dining in. To be honest, I felt there was not enough food given for what was being charged. Since I did like the Beef & Ricotta meatballs a lot, I wanted to try their sandwiches. On the second visit I got the Tie Baguette and substituted Chicken Meatballs for the Beef balls for an extra charge of $1. The soft chicken balls had a lighter taste and were savoury. However there was a gummy texture from the binder that was holding the meat together, which was a little off putting. The beef balls didn’t have this issue. The baguette was crispy on the outside and soft on the inside. The combination of marinara and three cheese sauces created a yummy, creamy, and tangy concoction. The bitter arugula added even more flavour to the sandwich. Overall, I enjoyed the messy to eat Tie Baguette more than what I tried on my first visit. However I still question if this was worth $10. To be thorough I decided on one more visit and went with a more conventional bowl. Once again I selected the Beef and Ricotta meatballs but paired it with pasta, marinara sauce and shaved Asiago cheese. The beef balls were great again. This time I tasted an herbiness which was a fantastic addition. Unfortunately the rest of the bowl was not very good. The pasta was bland and sweetly starchy. The tomato sauce was sour and devoid of any seasoning. The tartness told me that the sauce was not simmered long enough or not the best quality tomatoes were used. It was like the marinara was dumped out of can and simply re-heated. My third experience was the most disappointing of my 3 visits. I hope the owners can make adjustments and improve the other components of the menu items to better showcase that wonderful Beef and Ricotta meatball. 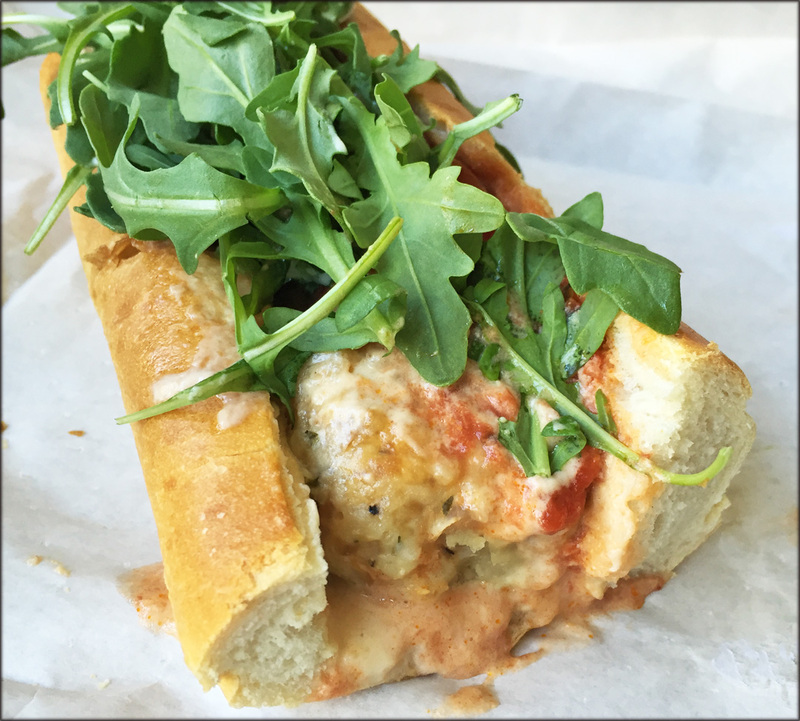 For $9 – $12, this meatball focused restaurant is competing with Meat & Bread (just a few shops south and has an amazing spicy meatball sandwich), the Tacofino Burrito Bar, La Taqueria, Tacomio, and the Dirty Apron Deli. All the competitors I named offer a much more complete, higher quality, and, in some cases, a larger amount of tastier food for the same price. Kofta will not be making my lunch roster of eateries.